Bobby Grant's 14th goal of the season saw Accrington stretch their run to 18 points out of a possible 21, despite having Andrew Proctor sent off late on. Jake Robinson should have put the home side ahead but side-footed wide after rounding goalkeeper Dean Bouzanis. But Grant fired in from close range after a mix-up between Kelvin Langmead and Shane Cansdell-Sherriff. Home keeper David Button made several fine saves before Proctor was dismissed for a second bookable offence. Shrewsbury's home defeat saw the end of their five-game unbeaten run, which began with a 2-2 draw at home to Macclesfield on Boxing Day. Now the League Two play-off hopefuls are hoping to embark on another run, starting with the return game at Macclesfield this Saturday (6 February, 1500 GMT). "We started well by getting the ball up to our strikers and we had a great opportunity with Jake Robinson. "After that, we stopped turning them, stopped putting them under pressure, and gave ourselves problems when we were a bit too tippy-tappy. "We had a go at them second half, but it's a massive disappointment to have lost the way we did. "But we've got to deal with it, move on and get ready for the next one - and get on another good run, simple as that." 90:00+3:37 The referee ends the match. 90:00+3:27 Terry Dunfield delivers the ball, Tom Lees makes a clearance. 90:00+3:06 Foul by Robert Grant on Danny Taylor, free kick awarded. David Button restarts play with the free kick. 90:00+1:44 Substitution Michael Symes leaves the field to be replaced by Billy Kee. 90:00+1:04 Booking Dean Bouzanis goes into the book. 90:00+0:41 Foul by Joe Skarz on John Miles, free kick awarded. Indirect free kick taken by Dean Bouzanis. 90:00+0:14 Michael Symes handles the ball and concedes a free kick. David Button restarts play with the free kick. 88:58 John Taylor concedes a free kick for a foul on Michael Symes. James Ryan produces a strike on goal direct from the free kick. 88:16 Joe Skarz crosses the ball, Dean Bouzanis makes a save. 88:07 Danny Taylor produces a cross. 85:48 Danny Taylor sends in a cross, clearance by Robert Grant. 85:08 Dave Hibbert concedes a free kick for a foul on Luke Joyce. Dean Bouzanis takes the free kick. 83:34 Terry Dunfield takes the indirect free kick. 83:34 Sent off Red card for Andrew Procter. 83:22 Andrew Procter concedes a free kick for a foul on Kris Bright. 82:08 Foul by Phil Edwards on Dave Hibbert, free kick awarded. Steven Leslie has an effort direct from the free kick, save by Dean Bouzanis. 79:59 Tom Lees produces a cross, clearance made by Danny Taylor. 77:30 The ball is sent over by Steven Leslie, clearance by Dean Winnard. 76:41 Substitution John Taylor joins the action as a substitute, replacing Jake Robinson. 74:34 Corner taken by John Miles from the right by-line to the near post, clearance by Dave Hibbert. Correction - 73:45 John Miles produces a cross, save by David Button. Luke Joyce takes a shot. Save by David Button. 73:45 John Miles crosses the ball, save by David Button. Luke Joyce takes a shot. Save by David Button. 72:11 Joe Skarz gives away a free kick for an unfair challenge on John Miles. Free kick taken by Luke Joyce. 70:52 Kris Bright takes a shot. Save made by Dean Bouzanis. 69:42 Corner taken by Steven Leslie, Kelvin Langmead concedes a free kick for a foul on Darran Kempson. Indirect free kick taken by Dean Bouzanis. 69:30 Kevin McIntyre crosses the ball, Luke Joyce gets a block in. 68:29 Dave Hibbert takes a shot. Save made by Dean Bouzanis. The ball is delivered by James Ryan, Effort from deep inside the area by Robert Grant clears the bar. 67:22 Free kick awarded for a foul by Danny Taylor on John Miles. Indirect free kick taken by Phil Edwards. 67:02 The ball is sent over by Dean Winnard, clearance by Joe Skarz. 66:14 Substitution Lewis Neal leaves the field to be replaced by Kris Bright. 65:15 Andrew Procter takes a shot. Save by David Button. 63:34 The ball is sent over by Steven Leslie, Dean Winnard manages to make a clearance. 62:51 Free kick awarded for an unfair challenge on Dave Hibbert by Darran Kempson. Indirect free kick taken by Shane Cansdell-Sherriff. 61:29 Outswinging corner taken by Steven Leslie from the left by-line, Lewis Neal takes a shot. Clearance made by Darran Kempson. 60:02 Andrew Procter takes a shot. Save made by David Button. 59:11 Kelvin Langmead challenges Michael Symes unfairly and gives away a free kick. Indirect free kick taken by Phil Edwards. 57:01 Kevin McIntyre delivers the ball. 56:42 John Miles takes a shot. Save by David Button. 55:24 The ball is crossed by Kelvin Langmead, clearance by Tom Lees. 52:59 Dean Winnard sends in a cross, Close range headed effort by Michael Symes clears the crossbar. 51:25 The ball is crossed by Danny Taylor, Phil Edwards makes a clearance. 50:54 Free kick awarded for an unfair challenge on Kelvin Langmead by Robert Grant. Danny Taylor takes the free kick. 50:21 The ball is swung over by Jake Robinson, clearance made by Dean Winnard. 49:15 Michael Symes produces a cross, David Button makes a save. 47:58 The ball is sent over by Lewis Neal, Darran Kempson makes a clearance. 46:22 Shane Cansdell-Sherriff takes a shot. Save by Dean Bouzanis. Corner taken by Lewis Neal, Shane Cansdell-Sherriff has a headed effort from close range and clears the bar. 45:49 Free kick awarded for an unfair challenge on Jake Robinson by Darran Kempson. Free kick taken by Steven Leslie. 45:14 Luke Joyce has an effort at goal from outside the box which goes wide left of the target. 45:01 Substitution Steven Leslie replaces Craig Disley. 45:00+1:28 The first half comes to an end. 45:00+0:36 Corner taken right-footed by John Miles from the right by-line to the near post, Craig Disley manages to make a clearance. 45:00+0:25 James Ryan produces a cross, Joe Skarz gets a block in. 44:37 Foul by Shane Cansdell-Sherriff on Michael Symes, free kick awarded. Darran Kempson takes the free kick. 44:11 John Miles produces a cross, Joe Skarz manages to make a clearance. 42:30 Foul by Shane Cansdell-Sherriff on Michael Symes, free kick awarded. Free kick taken by Tom Lees. 41:37 The ball is swung over by James Ryan, Shane Cansdell-Sherriff manages to make a clearance. 41:27 The ball is swung over by Robert Grant. 40:09 Dave Hibbert is caught offside. Indirect free kick taken by Dean Bouzanis. 38:12 The ball is swung over by Joe Skarz, clearance made by Dean Winnard. 37:03 Corner taken by Lewis Neal from the left by-line, Andrew Procter makes a clearance. 36:02 Lewis Neal fouled by Robert Grant, the ref awards a free kick. Shane Cansdell-Sherriff restarts play with the free kick. 32:59 James Ryan fouled by Joe Skarz, the ref awards a free kick. Dean Bouzanis takes the free kick. 32:08 Craig Disley challenges John Miles unfairly and gives away a free kick. Free kick taken by Dean Winnard. 31:11 Andrew Procter has shot on goal from just outside the area which goes wide of the right-hand upright. 30:02 The ball is crossed by Jake Robinson. 29:08 Shane Cansdell-Sherriff takes the indirect free kick. 29:08 Booking Andrew Procter receives a caution for unsporting behaviour. 28:52 Andrew Procter challenges Kevin McIntyre unfairly and gives away a free kick. 25:55 GOAL - Bobby Grant:Shrewsbury 0 - 1 Accrington Stanley Robert Grant grabs a goal from inside the penalty box to the bottom right corner of the goal. 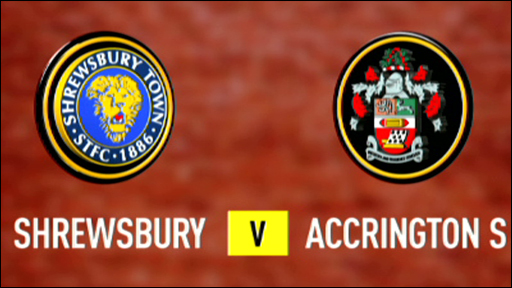 Shrewsbury 0-1 Accrington Stanley. 25:02 The ball is delivered by Kelvin Langmead, save by Dean Bouzanis. 24:19 James Ryan gives away a free kick for an unfair challenge on Lewis Neal. David Button takes the indirect free kick. 23:53 Centre by John Miles, clearance by Jake Robinson. 22:11 James Ryan produces a cross. 21:51 Michael Symes takes a shot. Kelvin Langmead gets a block in. 19:50 Unfair challenge on Kelvin Langmead by Michael Symes results in a free kick. David Button restarts play with the free kick. 17:47 James Ryan delivers the ball, Craig Disley makes a clearance. 17:03 The referee blows for offside. Indirect free kick taken by Dean Bouzanis. 16:28 Michael Symes takes a shot. Blocked by Shane Cansdell-Sherriff. 13:46 Jake Robinson has an effort at goal from close range which goes wide left of the goal. 12:10 Lewis Neal sends in a cross, clearance made by Darran Kempson. 9:41 Phil Edwards produces a cross, Danny Taylor manages to make a clearance. 9:25 James Ryan crosses the ball, clearance made by Kelvin Langmead. 8:24 Dean Winnard takes a shot. David Button makes a save. 7:29 Tom Lees fouled by Kevin McIntyre, the ref awards a free kick. Indirect free kick taken by Dean Bouzanis. 7:03 Jake Robinson takes a shot. Save made by Dean Bouzanis. 2:22 Robert Grant gives away a free kick for an unfair challenge on Shane Cansdell-Sherriff. David Button takes the indirect free kick.